Competition between Spain and Britain made Florida a haven for colonial South Carolina’s fugitive slaves in the 18th century. To destabilize British colonization in the north, Spain encouraged British slaves to escape to Florida, where they could convert to Catholicism and become Spanish citizens. In the 1730s, a black Spanish community formed in St. Augustine, the capital of Spanish Florida, and founded a town called Fort Mose. In the 18th century, two Fort Mose sites existed, one that the Spanish occupied between 1737 and 1740, and another occupied between 1752 and 1763. Fort Mose is the only known free black town in the present-day southern United States that a European colonial government sponsored. 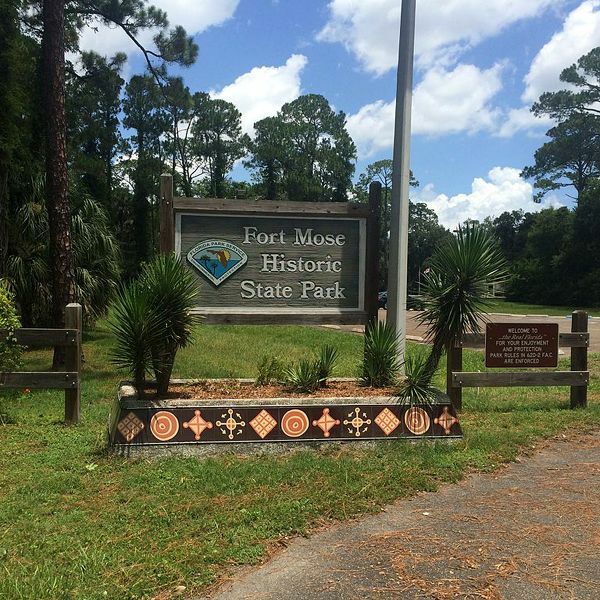 The Fort Mose Site, today a National Historic Landmark, is the location of the second Fort Mose. Fort Mose Site, a National Historic Landmark, is located at 15 Fort Mose Trail in St. Augustine, Florida. Fort Mose State Park, Florida, courtesy Wikipedia. Compiled by Kathy Weiser/Legends of America, updated September, 2016.